Two Books | Who Killed Orrin Grey? I’ve got two books coming out this year. One of them I wrote, the other I co-edited. I’d be hard pressed to tell you which one I’m more proud of. 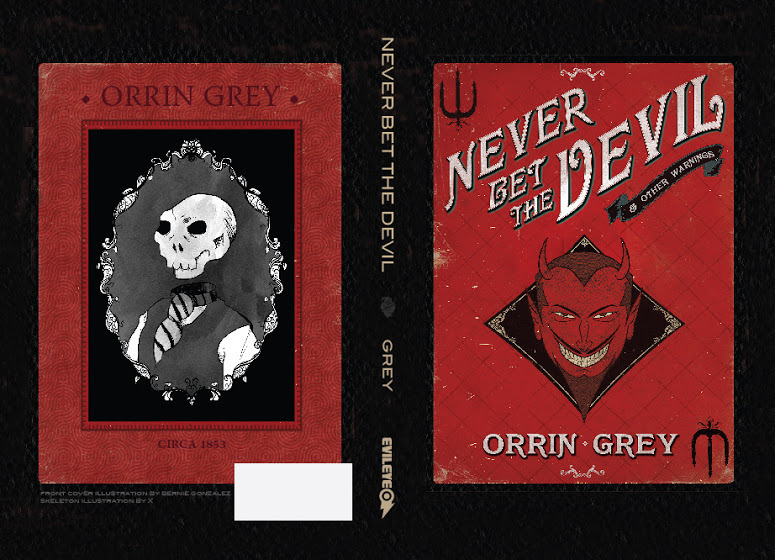 The first is my debut short story collection Never Bet the Devil and Other Warnings, due out pretty much any day now from Evileye Books. What you see up above there is the full cover spread for the collection, and over the weekend I got the uncorrected proofs in PDF. As soon as I get through those and get any notes sent back to the publisher, it should be on its way to the printers. It features ten stories (including my out-of-print novella The Mysterious Flame) and every story has an illustration by the great Bernie Gonzalez, whose work you can also see there on the front cover. It’ll be available in paperback and ebook formats, and I’ll be posting more about it just as soon as it’s ready to order. The second is Fungi, the anthology of fungus-themed stories that I co-edited with Silvia Moreno-Garcia for Innsmouth Free Press. I’ve talked about it at some length before, and you can learn more and see the full table of contents at its website. It’s going to be coming out in ebook, paperback, and hardcover (what you see above is the cover spread for the hardcover edition), and it’s available for pre-order at 20% off the cover price from now until November 16. I know that I’m a bit biased, but personally I’d recommend picking up the hardcover. It’s got three extra stories, and ten illustrations, these also by Bernie! As you can imagine, October is a busy season around our household, and this year that’s been especially true. Last weekend, Grace and I got dolled up and went out to see a ballet interpretation of the Carmina Burana at the new Kauffman Center for the Performing Arts. It was the first professional ballet for either of us, and we were duly impressed. (The Kauffman Center was pretty nice, too.) Tonight, we’re heading to the Plaza to see The Oatmeal talk about his new book. And this coming Saturday we’re having some people over to watch Monster Squad, since the Alamo Drafthouse is being renovated for the month of October. In spite of all that, I still managed to watch The Tall Man, Pascal Laugier’s follow-up to Martyrs. While it was pretty enjoyable, it wasn’t really as suitable for Halloween viewing as I had hoped. (For those of you thinking maybe it has something to do with Phantasm, sorry to disillusion you.) It’s really only a horror movie for about the first third, before it switches pretty sharply into something else entirely. It didn’t keep me as on my toes as Martyrs did, but I certainly wouldn’t have guessed where it was headed from the first reel, and that’s something. Lookin’ good, man, lookin’ good!